A widely used Over-the-counter analgesic and antipyretic. Have a greater efficacy in combination therapy than single-therapy without increasing the rate of complications in case of postoperative pain. 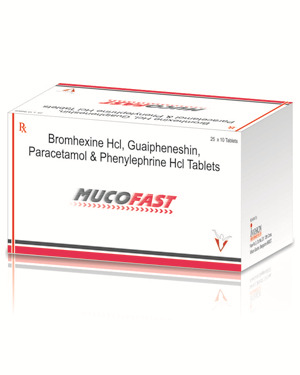 Enhances the rate of mucociliary clerance and also demonstrated an expectorant effect in patients with productive coughs. Works by encouraging the body's natural process for clearing mucus from the respiratory tract. An antihistamine used to relieve symptoms of allergy,fever and common cold. A nasal decongestant which helps to relieve a blocked nose. Reduces the size of the blood vessels in the nose & sinuses helping to breathe more easily.